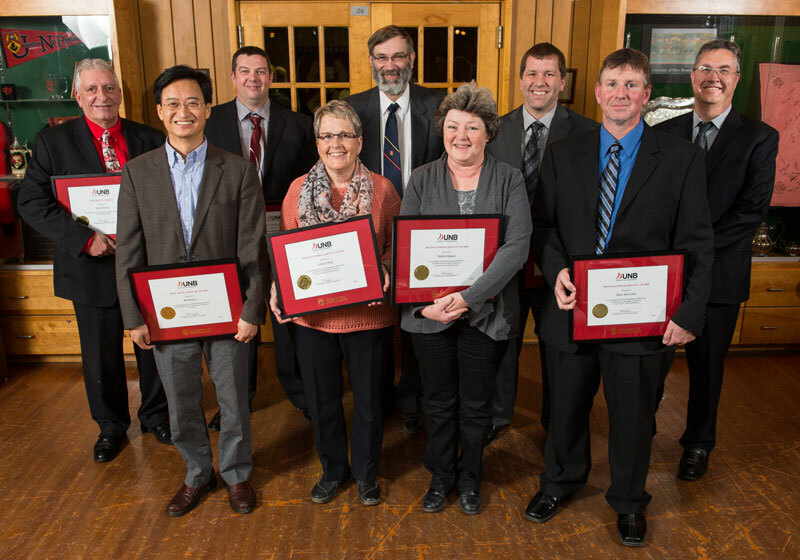 The President’s Awards, now in their 16th year, honour staff and faculty members for their contributions to UNB. President’s Medals for 2016 will be presented to Ed Biden and Dave Morell of UNB’s Fredericton campus. This prestigious award recognizes outstanding teaching, research and/or service over the span of a career. The UNB Distinguished Service Award honours outstanding service, both at UNB and in the community, that is related to university functions. The Fredericton recipients are Debbie Basque, Carolyn King, Dean McCarthy and Vanda Rideout (posthumously). The Saint John recipients are Kris Doucet and Kenneth Wetmore. The University Teaching Scholar Award recipient for 2016 is Yves Losier from the Fredericton campus. University Research Scholar Awards will be presented to Kenneth Kent and Kecheng Li from the Fredericton campus and Rémy Rochette from Saint John. A ceremony to honour the Fredericton recipients will be held in the Alumni Memorial Building on Tuesday, March 15, at 4:30 pm. The ceremony for the Saint John recipients is scheduled for Wednesday, April 20, at 2 pm in the Whitebone Lounge. The university community is invited to attend these ceremonies to honour their colleagues.